Figure 1. 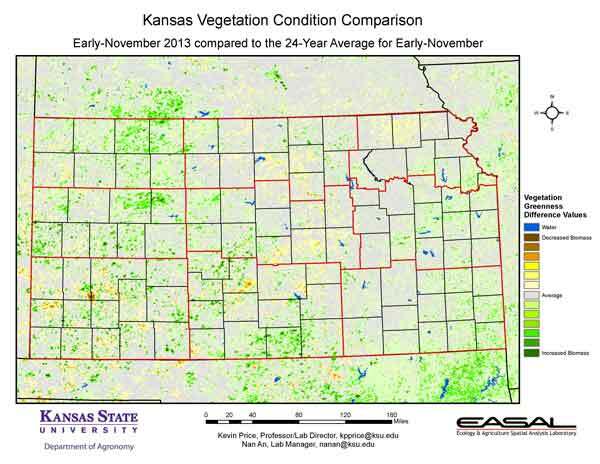 The Vegetation Condition Report for Kansas for November 5 – 18 from K-State’s Ecology and Agriculture Spatial Analysis Laboratory shows that vegetative activity has slowed greatly, as the first of November was much cooler than average. The greatest activity can be seen in the extreme east, and in Harper County in the South Central Division. Figure 2. 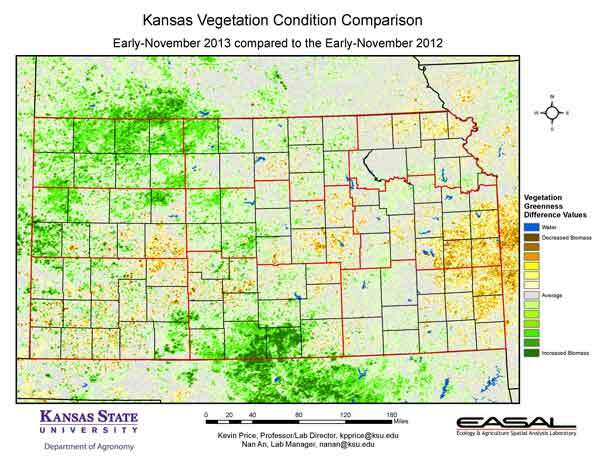 Compared to the previous year at this time for Kansas, the current Vegetation Condition Report for November 5 – 18 from K-State’s Ecology and Agriculture Spatial Analysis Laboratory shows that the Northwest and South Central Divisions have had the greatest increase, while the East Central Division has biggest decrease. 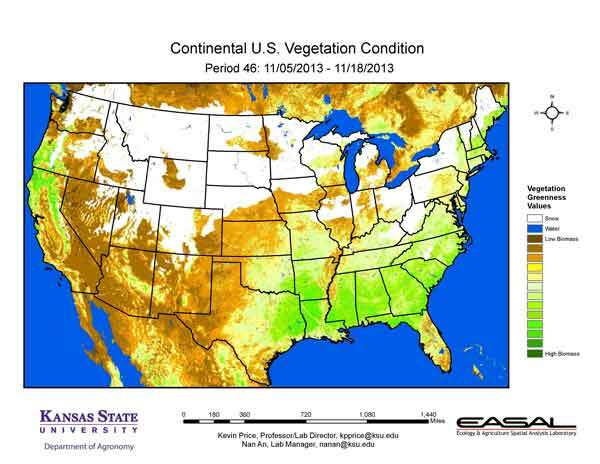 In the west, moisture and temperatures have been much more favorable this fall. This is despite the recent dryness. Figure 3. 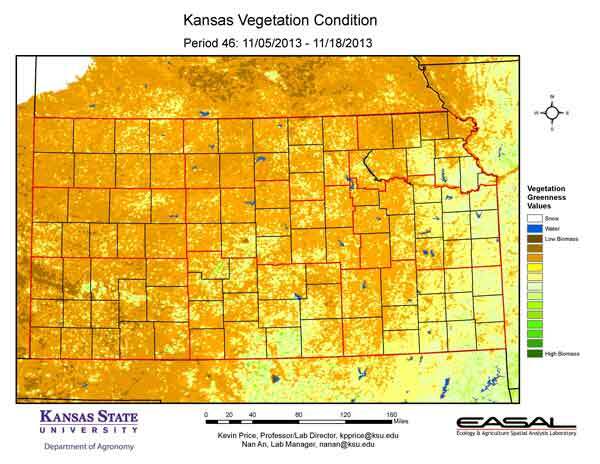 Compared to the 24-year average at this time for Kansas, this year’s Vegetation Condition Report for November 5 – 18 from K-State’s Ecology and Agriculture Spatial Analysis Laboratory shows that conditions are near to slightly above normal. Temperatures and moisture have been close to average for the period. The cold start to November gave way to warmer-than-average temperatures for the last week of this two-week composite period. Figure 4. 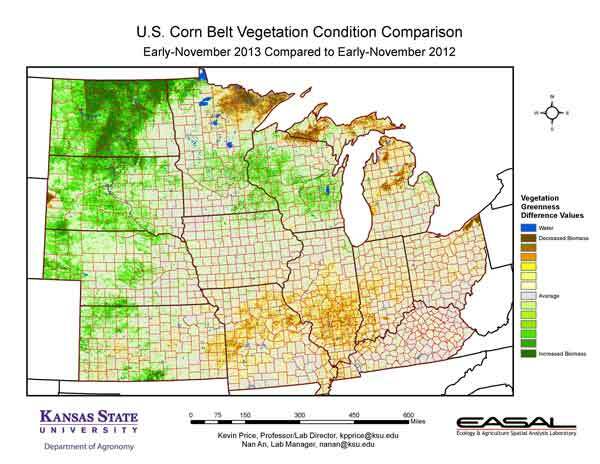 The Vegetation Condition Report for the Corn Belt for November 5 – 18 from K-State’s Ecology and Agriculture Spatial Analysis Laboratory shows that snow was again a feature. The snow pack, however, has only persisted in the northern most areas of region. Figure 5. 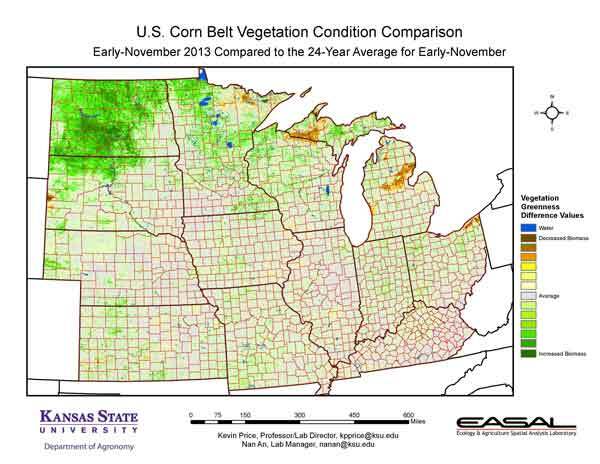 The comparison to last year in the Corn Belt for the period November 5 – 18 from K-State’s Ecology and Agriculture Spatial Analysis Laboratory shows that parts of the northern portions have the greatest increase in biomass production. The lower NDVI values in northern Minnesota, Upper Michigan, and northern Wisconsin are due to greater persistence of snow cover and wetter soils. Figure 6. 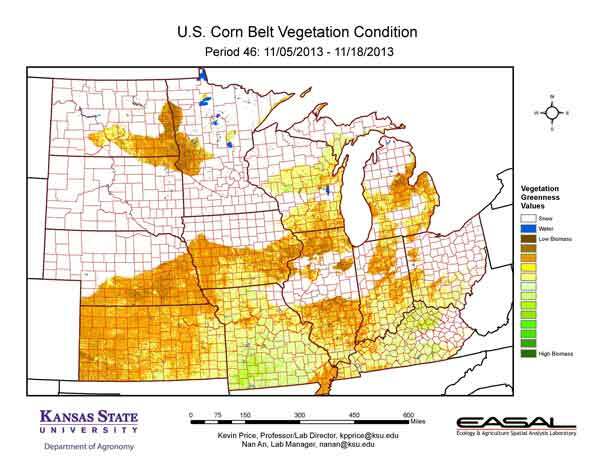 Compared to the 24-year average at this time for the Corn Belt, this year’s Vegetation Condition Report for November 5 – 18 from K-State’s Ecology and Agriculture Spatial Analysis Laboratory shows that the greatest departure from average is in North Dakota. Here, favorable moisture conditions and mild temperatures have encouraged biomass production. Figure 7. 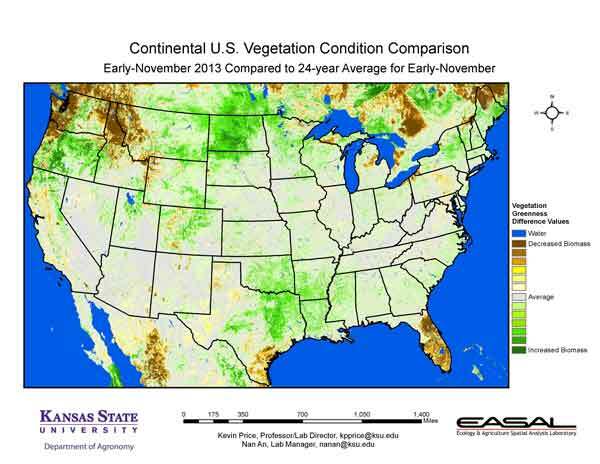 The Vegetation Condition Report for the U.S. for November 5 – 18 from K-State’s Ecology and Agriculture Spatial Analysis Laboratory shows that snow has been a feature in the northern half of the country. Active biomass production is greatest in the Southeast and along the northern coast of California and Oregon. Figure 8. The U.S. comparison to last year at this time for the period November 5 – 18 from K-State’s Ecology and Agriculture Spatial Analysis Laboratory shows that there is a decrease in activity in the mountains of the West, which is due to earlier and heavier snow cover. The increased productivity in the Northern Plains is due to the wetter conditions in these areas, plus temperatures that are closer to normal. Figure 9. The U.S. comparison to the 24-year average for the period November 5 – 18 from K-State’s Ecology and Agriculture Spatial Analysis Laboratory shows that the below-normal biomass production is greatest in southern Florida, and in the Pacific Northwest. In the Northwest, much of this departure is due to the heavier snow pack. In Florida, pasture conditions are declining due to cooler and drier weather.